I meant to send you a thank you card for you to read to the wonderful, generous quilters. So please rely the message to them. In Cuba we get to meet the ladies that do all the handwork They sell their items in the closest market and the proceeds go towards funding the church and also projects in the community. They were all so cute and of various ages. 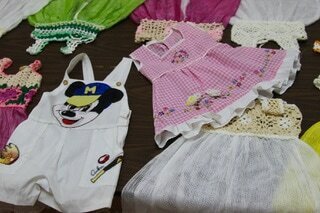 They make blouses, crocheted sweaters, table toppers, purses and beautiful children,s clothing. They were so excited to have so such pretty material to pick from. I am attaching a few pictures of their items and of the ladies themselves!! Again, thanks for all your generosity and kindness. Fallen Soldiers These quilts are donated to the families of the soldiers who have given their all for the freedoms we all hold dear. Bridging the Gap was founded in 2009 as a way to connect community donors to those living below the poverty line in Coweta County. Pregnancy Crises Center began serving Coweta Co in 1988 helping those in pregnancy situations, both planned and unplanned. Angel’s House opened in 2004 and is currently serving teenage girls. They can accommodate up to ten teenage girls. If you would like to help work on quilts for any of these groups please contact Barbara. Hetty, or Dee. Quilts for the veterans rehabilitation facility.